The Fireplacextrordinair | 564 Space Saver | Clean Face is just the thing for anyone looking to have a unobstructed view of the fire. 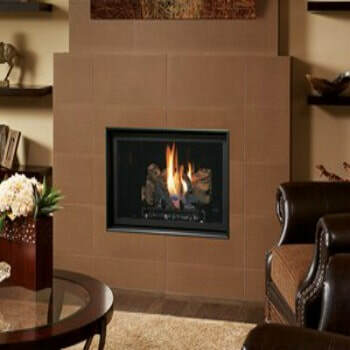 The clean face fireplace has no unsightly grills. Its modern appearance provides a clear view of the roaring flames. The unit sports 564 square inches of glass. The unit comes with the ANSI approved safety barrier. This precaution bolsters the overall safety of the unit. The 564™ SS is perfect for any small to mid-sized living space, heating up to 950 square feet. This unit includes the GreenSmart® Wall Mounted Thermostat Remote to easily manage the thermostat, accent light and fan. It also manages the Smart Mode, where the flame modulates as the thermostat demands more or less heat. This mode can save you money! The remote also gives you the choice of alternating between IPI electronic ignition and continuous standing pilot. *All measurements and colors are approximate. Contact Bare's for mored details. Specifications may change without notice. Please note Bare's Stove and Spa strives to update manuals and information as they become available. These are for reference only; the latest documentation by the manufacturer takes precedence. Please visit Bare's for color options, dimensions and additional information.